This week had a hefty dose of progress in the office, mixed with some panic that we have less that two weeks left to finish. Let’s start with all the good news first. The floor is done! Last week, we had picked a paint color (SW Repose Gray lightened to 50%), painted, and pulled up all the carpet. With that out of the way, we started laying the new floor on Friday. I didn’t think there was any way to swing new flooring in the budget. But where there is a will, there is a way! I found some 6″ x 24″ vinyl tiles at Lowe’s that could be grouted like real tile, but were completely affordable. Plus, they could be cut with an Exacto knife. No wet saw required. When I added up the cost and realized the whole office floor could be done for under $300, I was in. The tiles went down easily and would have been fast in a brick pattern. 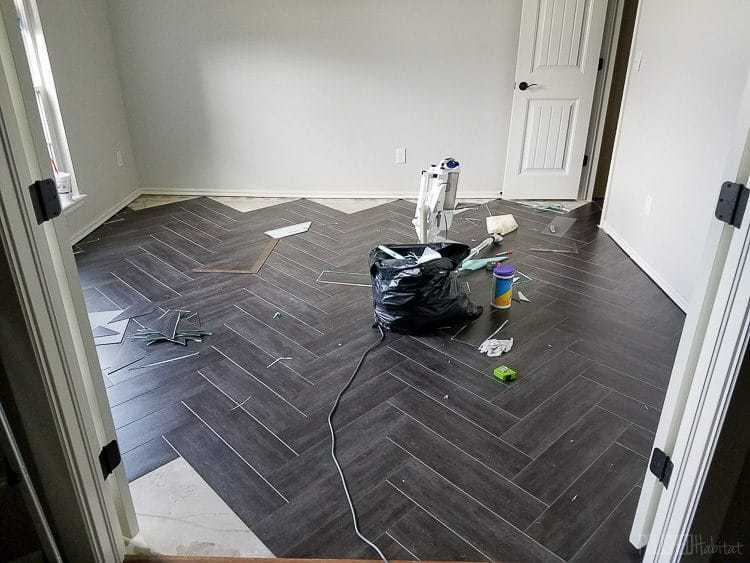 The herringbone took a bit longer, but the floor looks like it cost WAY more than $300. I don’t want to spoil all the reveal fun, but here’s a pretty major peek that shows where we were at on Sunday morning. After we finished all the perimeter cuts, it was time for the grout. Mom came over Monday to hand model for me. Actually, don’t let her pretty finger nail polish fool you, she worked HARD on grouting day and saved me. 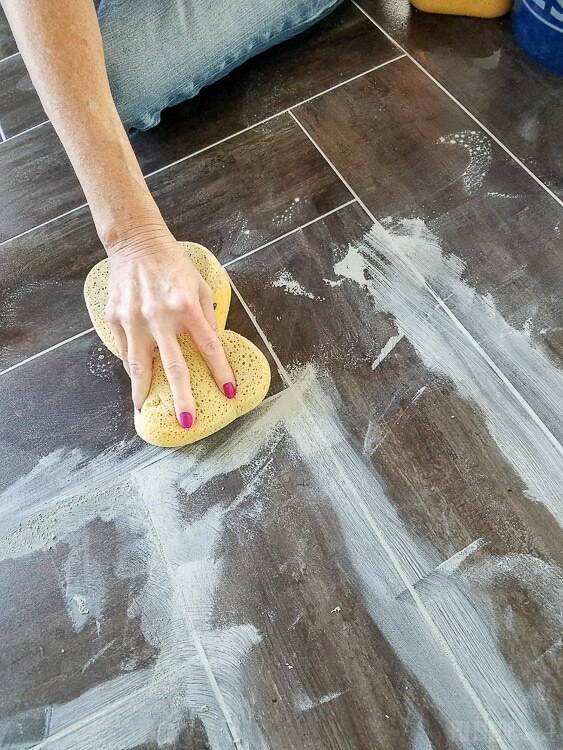 I was able to apply the grout while she worked behind me doing the clean up of the tiles. As she pointed out, I like to make messes and she likes to clean, so it was the perfect division of labor! Tuesday night, we finally started replacing the molding. First, we pulled the old stuff off the wall. Why yes, we probably should have done that before painting. After demo, we finished the closet door frame and then those dang Cubs and Indians got in the way of my progress. Did someone forget to tell the MLB that the One Room Challenge is going on? Couldn’t the World Series start after the reveals? Not okay, baseball. Not okay. Hopefully we can finish the molding today, which means I’ll finally get to move some of the furniture back in and start organizing. Quite a few key things are coming from IKEA, and they are MIA at the moment. Delivery was scheduled for today by a local courier. But, they haven’t even received the stuff yet. YIKES! They think they will get it tomorrow. I’m crossing my fingers they’ll be able to turn around and bring it to me Friday. In happier news, the rug did show up and I love it! All in all, it was a good week. Two weeks left is scary, but we can do it! Install Curtains – Dang, I still need to buy a curtain rod! 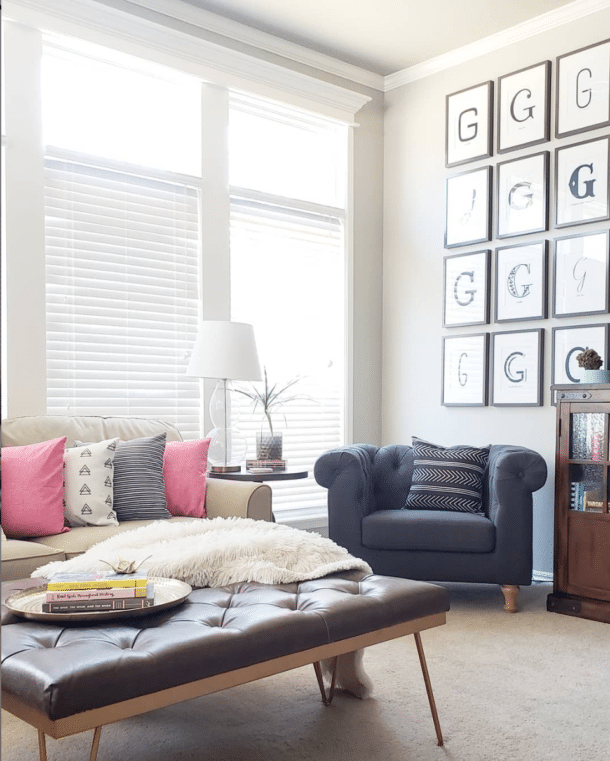 Pick and Order Rug (I can’t find the one I used in the mock up – help!) –Done and Delivered! Pick and Order Chairs – Might go with these white beauties from At Home. I need to go sit in them ASAP! ORGANIZE EVERYTHING – Can’t wait to get to this part! Don’t forget to check out all the other One Room Challenge progress this week at Calling it Home. With two weeks to go, some will be almost done and others will be panicked. It’s a bit like a reality show. I love every minute! melissa… that floor is gorgeous! We just got done installing the tile in our master bath for the Orc too! 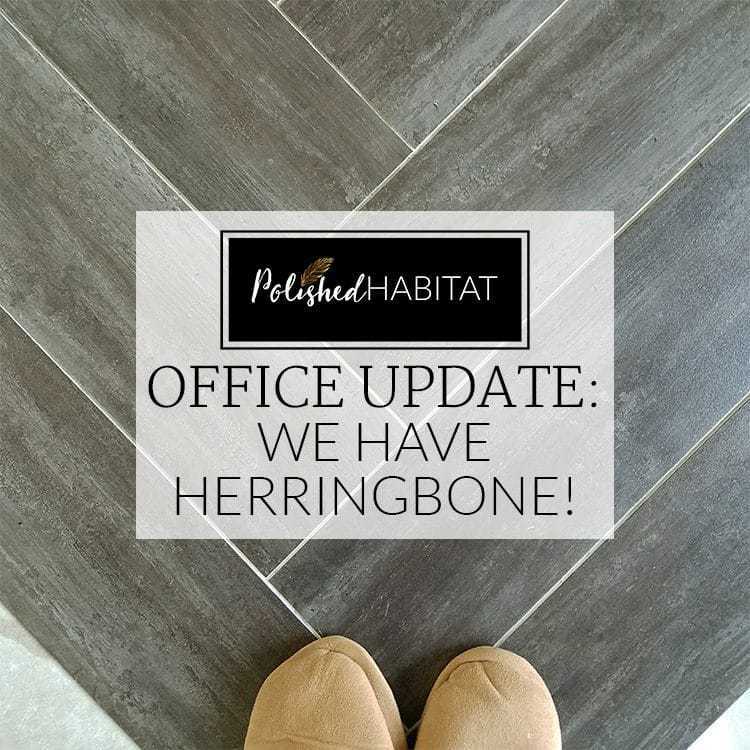 Good call on the herringbone! oh and that pink rug! High five for getting all the tiling out of the way this week! 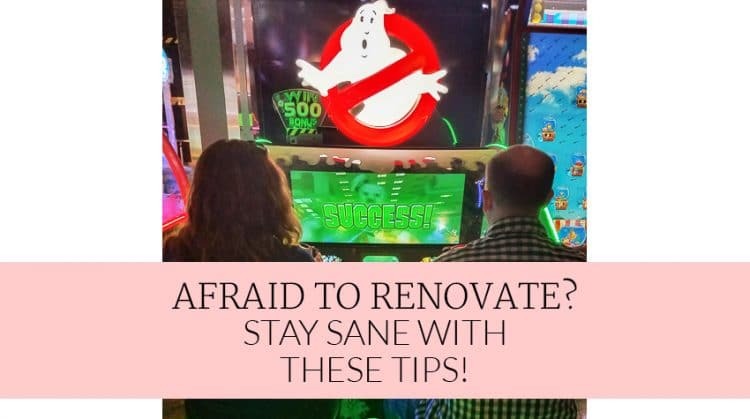 Um those floors with that beautiful rug on top is going to be an absolute show-stopper! We went with Repose in our dining room, too. It’s one of my faves! You just keep working your magic in this office! Thank you, Rachel! I’m loving the color! I might be hyperventilating about my ability to get everything else done. The days are flying by too fast! Your floor looks amazing Melissa!! I love the herringbone!!! Can’t wait to see that rug in place!!! Thanks Tammy! We literally just finished caulking the new base molding. I’m crazy excited to get the room cleaned up in the morning so I can unroll the rug all the way. i haven’t seen it yet either! I’ve been telling my husband I want to do herringbone floors SOMEWHERE in our house and he keeps saying no. I absolutely loveeee how the floors look. I mean it could not look better. I can’t wait to see the full reveal! 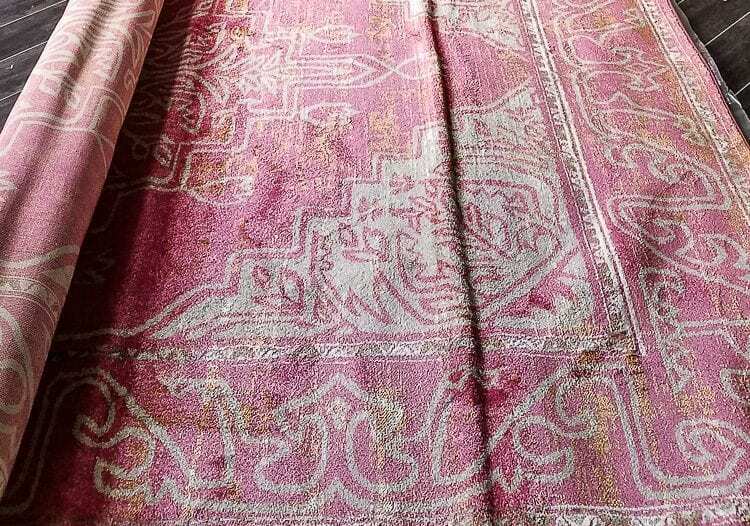 Thats rug is to drool over, its like a blush color! its goes so well with the flooring! I can’t wait to see the final end. 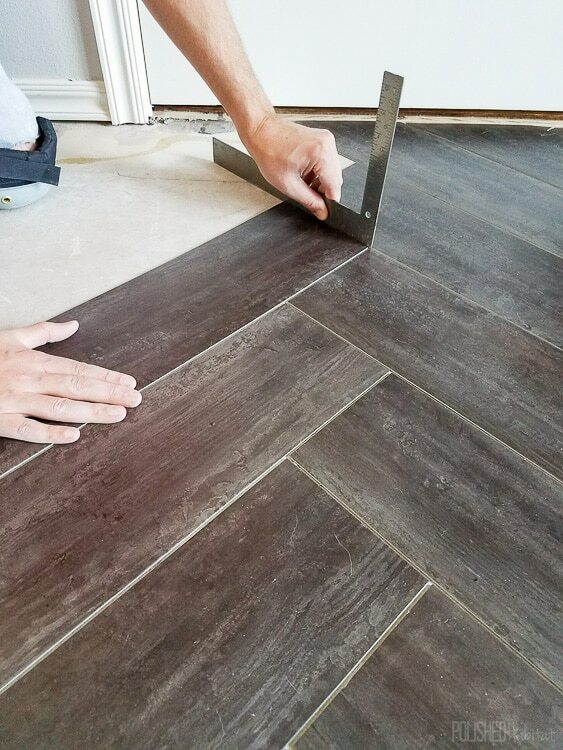 Who would have thought there would be grout-able vinyl flooring?! AMAZING! 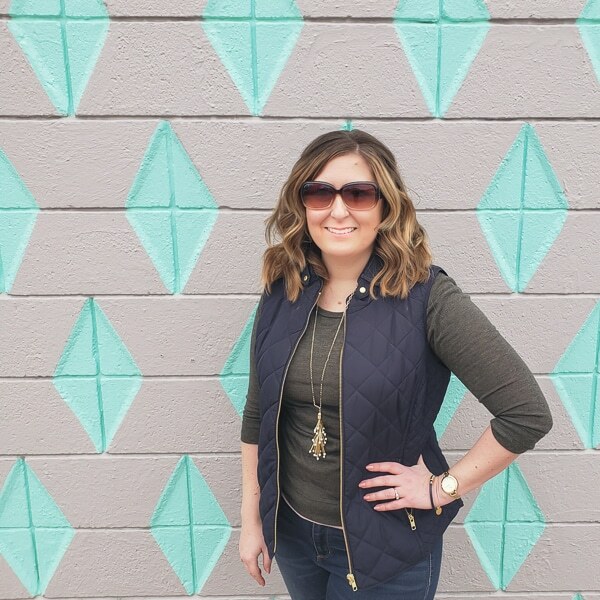 The herringbone pattern is my fave! And the pink rug…swooooon. Oh my gosh , the floor looks fantastic!! The herringbone pattern really elevates the look and I love that your mom helped you. What a sweet mother! I think my favorite is the pink rug bc I looove mine in my office. It’s gonna really brighten your mood just having that color. Great progress, Melissa!! Melissa! That tile is fantastic! What a perfect option. I just love that you can grout it. and your hand model!!!! Gorgeous! What are dear mom to help you out! I can’t wait to see everything falling together for this coming week! That tile! It looks awesome, and the fact that you were able to do the whole room for under $300! That is amazing! Oh my goodness! Beyond gorgeous – love the floor till color and that rug! It is the perfect shade of pink! Can’t wait to see the finished space. Melissa! Your floor! That rug! Ugh! I have never hated my upstairs carpet more! You are killing it and I totally feel you- football and the World Series have seriously hindered progress here too!! That Rug! The floor! Oh my…it will be so lovely. I truly cannot wait to see the final reveal and know that you are so excited about it! Sorry it took me all week to finally comment, but I’ve been drooling over that herringbone floor tile and pretty pink rug ALL WEEK LONG! I absolutely love everything about this week! That herringbone flooring is everything and so is that pink rug!! Beautiful! Did you cut any of the tiles other than the perimeter tiles? Sorry it took so long to reply, Hannah! We didn’t, the only ones cut were around the outside of the room.